In the first half of the 20th Century, tales and scenes of gorillas who carried away white women were fairly common in magazines, books and movies from various genres — including adventure, horror and comedy. Well known examples include the Tarzan stories by Edgar Rice Burroughs and the film with the biggest girl-crazy ape of all time, King Kong. After writing my recent post about “Monkey Madness,” I decided to climb out on another branch of the simian family tree and feature some men’s adventure magazine covers in the girl-crazy gorilla subgenre. Two of them are Will Hulsey animal attack masterpieces (and I use that word seriously). 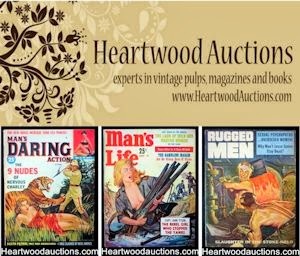 Hulsey painted the one at left on the cover of the October 1956 issue of True Men Stories. At right is another Hulsey gorilla attack cover painting. 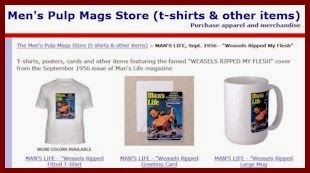 It’s on the March 1958 issue of Man’s Life, the men’s adventure magazine that probably featured more Hulsey animal attack covers than any other from the early-1950s to the late 1960s. The scene on the Man’s Life cover almost seems like a continuation of what’s happening on the True Men’s Stories cover. It shows a menacing gorilla holding a similar-looking babe in a red blouse, while a similar-looking manly hero plunges a knife into the ape’s neck. 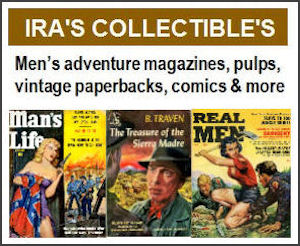 True Men Stories was published from 1956 to 1965 by Feature Publications, an affiliate of Crestwood Publishing, which also published Man’s Life. 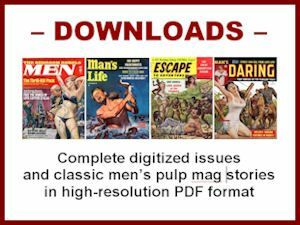 In 1966, True Men Stories was bought by Stanley Publications and stayed in print until 1973. Stanley, and it’s affiliate Normandy Associates, were second only to Martin Goodman’s Magazine Management in the publication of men’s pulp magazines in the 1950s, 1960s and early 1970s. 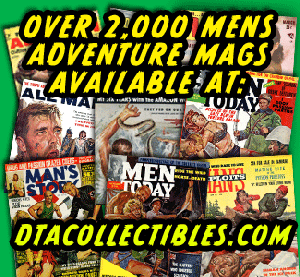 In addition to True Men Stories, Stanley and Normandy published All Man, Battle Cry, Champion for Men, Man’s Adventure, Man’s Best, Man’s Look, Man’s Prime, Men in Combat, Men in Conflict, Real Action, Real Men, Real War, Rugged, Rugged Men, Spur, True Battles of World War II, War Criminals and Women in War. The artist who did the wild gorilla cover on the March 1961 issue of Stanley Publications’ Man’s Adventure is uncredited. Ah yes, those were the days. When we assumed that gorillas were more dangerous than humans. Today, of course, most of us humans — and the remaining gorillas that are left in the wild — know it’s the other way around.